Why is it important to have a Job Offer Template? You’ve interviewed lots of potential candidate for a fixed-term job and you’ve found the person that you think is right for your business. But then what? You know you need to offer them the job in writing but what’s the correct way to do it? This is where HR Heroes Job Offer Letter Template (Fixed Term) comes in! When you take on a new member of staff you need to confirm the details of their employment with you within a job offer letter, but along with that there is other information that you are required to clarify by law, such as their eligibility to work in the UK. The Job Offer Letter Template (Fixed Term) are easy to use and will give you all the details you need to include in your offer to your new employee. Just about to offer a potential new Employee a job but you’re not sure what you need to send them? 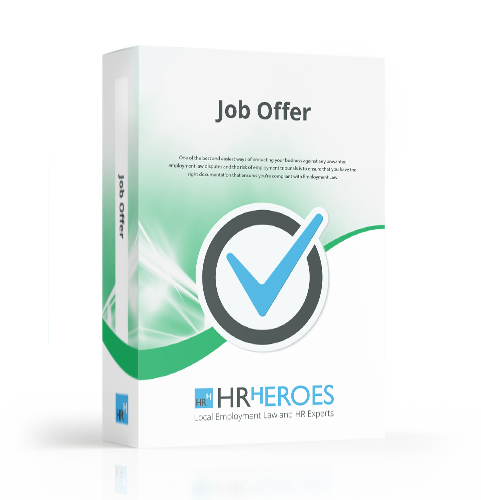 HR Heroes Job Offer Package will guide you. When you take on a new member of staff you need to confirm the details of their employment with you within a job offer letter, but along with that there is other information that you are required to clarify, such as their eligibility to work in the UK. The Job offer Package details all the info you need to find out from a best practice stance but also from a legal perspective – the job offer package has all the letter templates and forms you need that will guide you through this process. If you want to know more about how the Job Offer Process, give one of our experts a call who will be happy to help you!